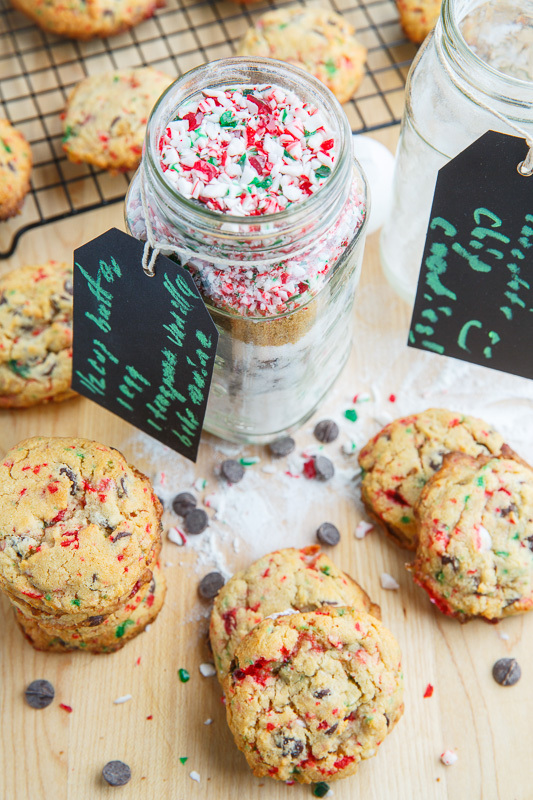 Peppermint white chocolate chip cookies in a jar, the perfect gift for the holidays! Looking for a last minute gift idea with a personal touch? 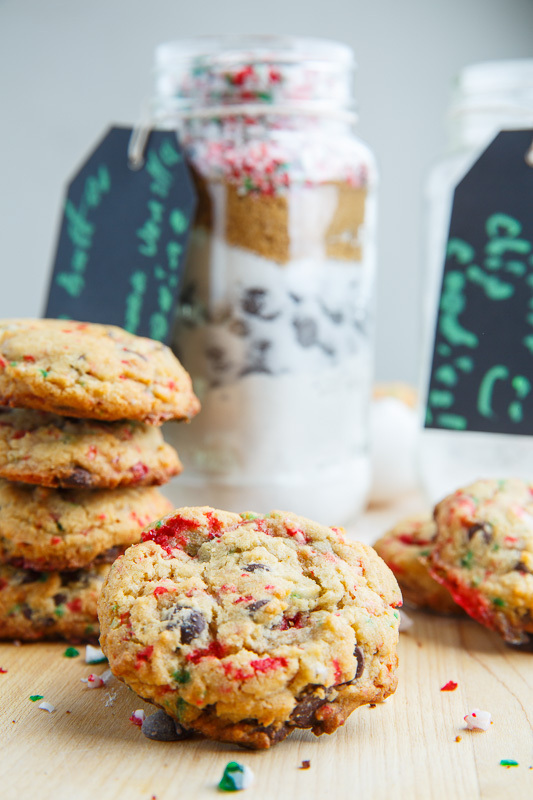 How about the gift of homemade cookies in a jar? I take my favourite holiday cookie recipe for peppermint candy cane chocolate chip cookies and place it in an almost ready to bake jar to give out as gifts! All one needs to do is empty the contents of the jar into a bowl and mix in butter and an egg before baking and enjoying! 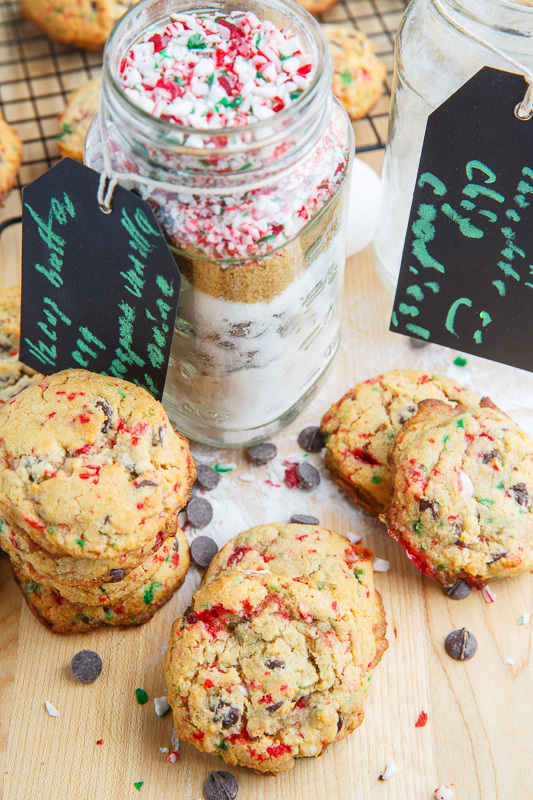 These peppermint candy cane chocolate chip cookies in a jar are so easy to get ready to give out as gifts and so easy for the recipient to make! They’re like xmas in a jar! 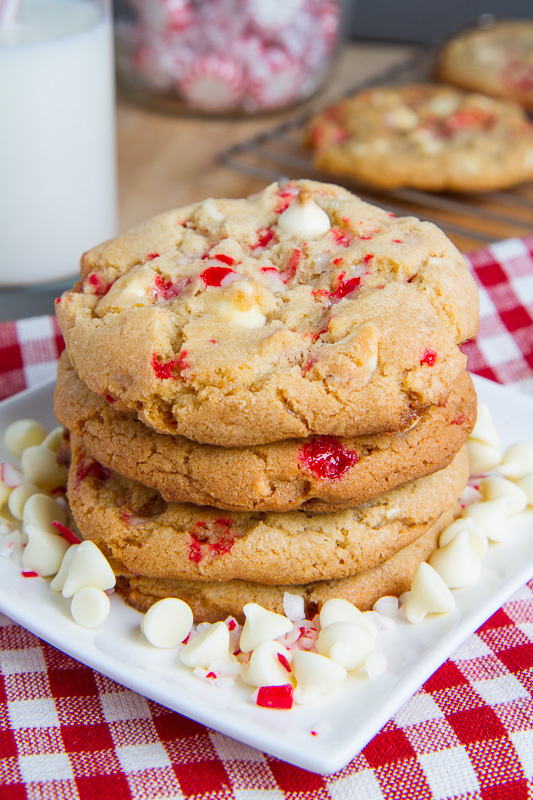 These cookies are decadently delicious with white chocolate chips! They are absolutely amazing with dark chocolate chips! Mix the flour, baking soda and salt, place in a jar, followed by the brown sugar, sugar, chocolate chips and crushed peppermint candy cane. Mix everything with the butter, egg and vanilla, form into 1-2 tablespoon balls, place on a baking sheet with 2 inches of space between and bake in a preheated 350F/180C oven for 8-12 minutes, until the bottoms just start turning a light golden brown before removing from oven and letting cool on pan for 5 minutes and transferring to a cooling rack. Option: Use dark, chocolate chips, white chocolate chip or milk chocolate chips. What a cute idea – what size jar?